Equip: How will I equip students for expected performances? How does scarcity and choice govern our economic decisions and the world around us? Teachers will use Monopoly money and a limited resource (12 chocolate bars in a room of 30 students) to illustrate the effects of supply and demand. 1. While this is a lesson on Supply and Demand, teachers should not pre-teach this economic concept. Rather, allow students to generate their own Laws of Supply and Demand based on this activity at the end of the lesson. 2. The teacher plays two roles; she is initially the banker and later, the retailer. As the banker, the teacher instructs all students to leave the room, form a line outside the door, wait 30 seconds, and then re-enter. The teacher is sitting behind a ‘banker’s desk’ and now hands out small piles of money to each student as they file up to the desk, one by one (each pile of student money must contain a variety of bills reflecting a variety of pay for a variety of jobs. Note that 2-4 piles should include more money than most receive / less money than most receive to make things interesting). How are our common everyday decisions closely interconnected with how society, the environment, and the economy function? Students will take an active role in a simulation game of ‘a local community of stakeholders’ fighting for a limited resource. Lessons 3 - Is Free Trade Free? How do we determine what is valuable to us as individuals and as a society? Teachers will use dollar-store items (or other treats that can be hidden in a paper bag) to explore the reasoning behind free trade and economic sacrifice for economic satisfaction (* Refer to Fraser Institute in Resources for original source). This quick activity allows students to share in the moment when a good thing becomes too much of a good thing. 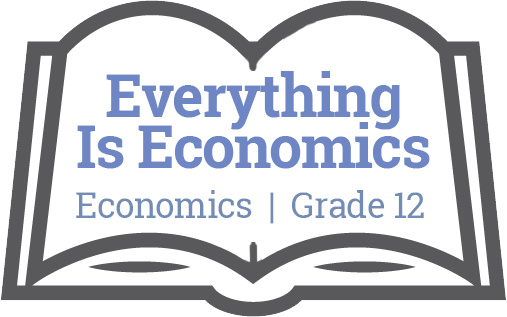 This lesson explores economic theories, such as The Tragedy of the Commons, and who should own Canada’s natural resources if we wish to maintain them for future generations. vi) developers demand to widen the causeway to facilitate faster movement of cars to the North Shore. For every action there is a reaction, particularly in the economy. Externalities are a frequent result of careless corporate behavior and the economic fallout reaches beyond the Board room with political, social, health, and environmental consequences. What type of economy brings the greatest levels of satisfaction to the greatest number of people?